Create a thriving routine using all three of our facial oils and enjoy maximum botanical benefits. Our organic face oil set includes all three of our plant derived facial oils for optimal results. 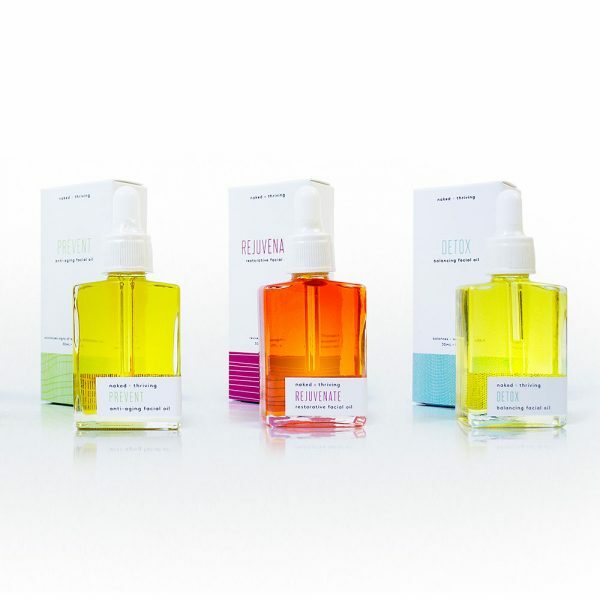 This set includes 3 full-size (1 oz/30 mL) facial oils: prevent, rejuvenate & detox. prevent anti-aging facial oil: Prevents and minimizes signs of aging, wrinkles & facial sagging while enhancing & tightening skin. rejuvenate restorative facial oil: Repairs & restores skin to natural, youthful beauty while helping to regenerate skin cells and repair damaged tissue. detox oil balancing facial oil: Purifies skin, removes impurities and regulates oil production while reducing redness, roughness & pore size. Suggested Routine: While any oil can be used day or night, in order to obtain maximum botanical benefits try using Prevent in the morning and Rejuvenate in the evening. After particularly dirty or harsh days swap Rejuvenate with Detox. Usage Tips: Dispense 4-7 drops onto fingertips and rub together lightly. Gently press oil onto clean face and neck distributing evenly. If your skin needs more moisture, repeat. Allow oil to absorb for 3-5 minutes before applying further products. Can I use if I have oily skin? Absolutely. When we over-wash and/or do not thoroughly moisturize our skin, it reacts by overproducing oil and sebum that leads to clogged pores and oily skin. These plant oils hydrate skin without clogging pores so that skin can cease production of excess oil. *Certified organic ingredient. This product is formulated with 86% organic content. *Certified organic ingredient. This product is formulated with 95% organic content. This the second time I have purchased N&T oils, this time I bought all three and I am completely pleased on how good it feels to put them on and more importantly, how good my skin looks. I rotate between the three and use them day and night, and since doing this I have stopped using foundation and only apply a bit of blush to my cheeks and mascara to my lashes. In addition, I have received so many compliments and questions such as, "what are you using on your face, it looks radiant and healthy? ", or "how do you keep your skin looking so good? "; I've shared the information with friends and hopefully they have also started to use the oils. Lastly, on top if hydrating so well, I love the scent of all the oils! Enjoy! I was using a similarly priced, high end, single bottle serum and was getting to the point where I needed to repurchase when I saw a posting that included the Naked + Thriving Rejuvenate product as well as the oil I was using. They were ranked #'1 and #2 with the N+T oil coming in 1st. Obviously, I had to check into this product. I read the reviews and ended up purchasing the three oil package. I was really pleased to find EACH of the three oils was equal in volume to the one bottle of the other oil I was using. I figure each different oil blend has more of the individual oils in the blend and so is more effective. Just theorizing. In any case, I do notice that my skin takes in the oils more quickly, no greasy feel on my skin's surface, and yet my skin has remained soft and hydrated -even through the recent polar vortex! Daily I use sunblock and a bit of a primer (YoungLiving) after the oil, but no makeup base at all (I'm 67). The oils smell wonderful - each is different. I expect my oils will last a long time and I won't need to replenish all three at once anyway due to rotating between the Detox and the Rejuvenate. This makes the price much more reasonable; I absolutely recommend checking into this set of oils! I'm 53 years old and purchased the trio. I use Prevent during the day. My skin tends to get extra dry in the winter and the Detox and/or Rejuvenate alone in the evening wasn't enough. What has been working for me after I wash my face at night is applying the Detox first then I add a little Rejuvenate on top. My skin is nice a soft and not dry at all in the morning. So far I like the results I'm getting from these products. Formulated from 100% plant botanicals, this facial oil prevents and minimizes signs of aging, wrinkles & facial sagging while enhancing & tightening skin. Formulated with 95% certified organic content, this organic face oil helps balances skin, removes impurities and regulates oil production while reducing redness, roughness & pore size. Formulated with 95% certified organic ingredients, this oil helps restore skin to its natural, youthful beauty while helping to repair damaged tissue and improve elasticity. Formulated with 98% certified organic content this lightweight body oil absorbs quickly and provides skin with incredible hydration.